Hamble Foreshore Car Park is owned, managed and maintained by Hamble Parish Council and offers easy access to the Quay and the village's High Street. Charges apply 7 days a week between the hours of 8am and 6pm. Parking can be paid for with change via the parking machine, or by credit/debit card via RingGo. Disabled badge holders get 4 hours free parking in any one day - including Sundays and Bank Holidays - in marked bays, only when displaying a Disabled Badge. RingGo is a convenient, cash-less parking solution allowing users to pay for parking via the RingGo App or by calling RingGo on 0203 046 0010. The location code for the Foreshore Car Park is 4913. A small convenience fee is applied for using this service. For more information about how to use RingGo, click here to go to the RingGo website. 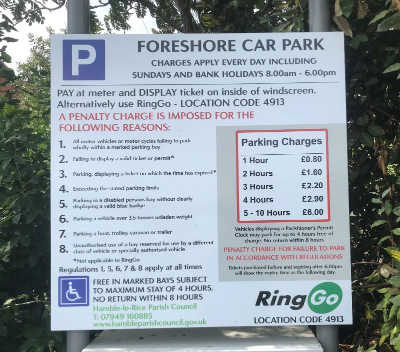 Hamble parishioners on on the Electoral Roll can obtain a permit which allows up to 4 hours free parking in the Foreshore Car Park per day.